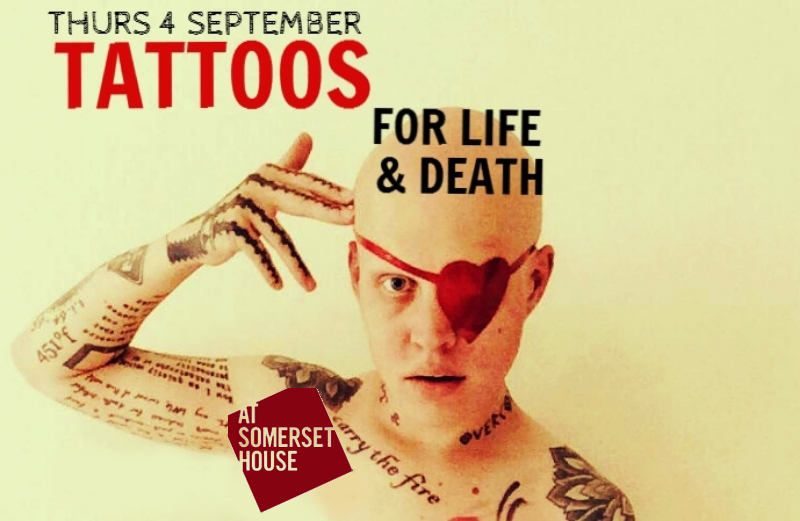 With only a week to go until the first salon of our Autumn season, we’re excited to announce the two tattooed models who shall be taking to the plinth at our event ‘Tattoos for Life & Death’ next Thursday. They’ll both be posing at Somerset House’s studio for your sketching pleasure…capture the drawings on their bodies in your own drawings. Heather has tattoos by many different artists, including several featured in the Time:Tattoo Art Today exhibition (free to view at Somerset House so do be sure to browse the exhibition before coming to our salon on Thursday!). Her work includes pieces by Valerie Vargas, Guen Douglas, Chad Koeplinger and Tutti Serra. Model Heather Holyoak. Photo taken by the wonderful Heather Shuker for the first issue of Things and Ink, wearing BloodyMary Metal and Agent Provocateur. Our second model Drew is equally covered in amazing art. Including a large skull and anatomical heart piece on his chest, a work in progress, and several quotes that really are ‘memento mori’ addressing ideas of mortality, death and the passing of time. His artists include Duncan X, Delphine Noiztoy, Thomas Hopper and Alex Binnie. Photo: Drew Beckett. All rights reserved Drew Beckett. To join us, you can buy tickets here for £15, which includes drawing materials provided and a complimentary rum cocktail!